"When things are at their darkest, pal, it's a brave man who can kick back and party." One of the many reasons I love movies is that for two hours I am able to suspend rational thought. Even the most absurd concepts can seem believable when they occur within a well-crafted motion picture. The premise of Innerspace is so far-fetched and improbable that it is a wonder it was ever created. However, its entertainment value lies within its implausibility. Particularly ridiculous is a scene where a character's nerves are altered by a computer within seconds to give him an entirely new face. Ludicrous this may be, but this visual gag is so hilarious that one is not given a chance to ponder its inanity until long after the film has ended. Innerspace is an entirely silly idea that has been expertly crafted into an entertaining piece of cinema magic. Lieutenant Tuck Pendleton (Dennis Quaid) is a down and out Navy pilot who drinks too much and cannot seem to get a handle on his relationship with Lydia (Meg Ryan). Looking to give his career and self-esteem a boost, he offers to be the guinea pig in a scientific experiment where he will be miniaturized and injected into the bloodstream of a rabbit to conduct medical research. Shortly after Tuck is reduced to the size of a tiny molecule and shot inside a syringe, thieves break into the lab to steal this heavily sought after miniaturization technology. After a frenetic chase sequence, Tuck is hastily injected into the body of Jack Putter (Martin Short), an unsuspecting and neurotic grocery store clerk. Through modern technology, Tuck is given the ability to see through Jack's eyes and communicate with him, and the real madness begins as Jack races against time to find a way to get tiny Tuck out of his body. Executive producer Steven Spielberg once again teamed up with Gremlins director, Joe Dante, to create breathless escapist entertainment. Similar to the 1966 film, Fantastic Voyage, the Oscar�-winning visual effects created by Industrial Light and Magic are still as impressive today as they were 15 years ago. Visual effects supervisor Dennis Muren and his talented staff have meticulously created the confines of an inner body so believable that critic Roger Ebert even wondered if one shot of a beating heart could have possibly been actual footage of a real human circulatory pump. The film's appeal is not exclusively due to its special effects; there are big laughs from one scene to the next, especially from the gifted comedian, Martin Short. These comedic moments are then intertwined with thrilling action sequences. The moment when Jack breaks free from the back of a box truck and attempts to leap into a moving car is wildly entertaining in both its well-timed physical comedy and deft editing. The fun of Innerspace overrides most of the problems with the film. In addition to the implausibility factor, many of the characters are rather quickly thrown into the mix without a proper introduction. Of course, fruitless character development would probably detract from the frantic pace of the film, which still works quite well despite the story being a bit hollow in the center. One element that I found quite awkward is the lack of attention to Tuck being a fall-down drunk. His obvious problem is never dealt with or resolved, which causes the outcome of the film to feel deceptive. I may be nitpicking, but I found this oversight to be somewhat distracting. Even though his character has been mishandled, Dennis Quaid does a wonderful job at expressing emotion in such a limited environment. Quaid has to execute most of his scenes within the confines of a tiny pod, yet he always finds the right vocal inflections and facial expressions to make his character interesting. Furthermore, he and Short have found a great chemistry amongst one another, despite the fact that they hardly share any screen time together. Short is also at his comic best, using his acrobatic styles to the fullest without overplaying his antics. Innerspace may have flaws, but these mild nuisances are merely microscopic bugs on the roadmap for a film that works in all the right places. The film has been set up as an excuse to give the audience two hours of nonstop fun, and on this level, Innerspace more than delivers. It is not simply one hysterical moment after another, but rather moves with a more natural sense of comedy. I never felt as if the filmmakers were overdoing it by reaching too far for a laugh. The well-executed humor, action, and eye-popping special effects make Innerspace an engrossing film that is very difficult to dislike. Image Transfer Review: Finding myself unimpressed with many of the 1980s transfers I have seen recently, I was not expecting much from Innerspace. Much to my delight, I was treated to one of the most vibrant and detailed pictures I have seen in quite some time. Color is stunning, with lush saturation and flesh tones that appear consistently natural. The level of detail is remarkable throughout, and video noise is virtually non-existent. Grain is occasionally detectable, specifically during the inner body shots, yet this is never overtly distracting. While not a picture-perfect transfer by today's standards, the anamorphically enhanced image is a beautiful sight to behold, and one of the better transfers I have ever seen of a pre-1990s film. Audio Transfer Review: While not as impressive of a restoration effort as the image transfer, the 5.1 audio is pleasing. Dialogue sounds a bit thin and leaning towards the high end of the vocal range, yet never does it sound strident or unpleasant. Stereo separation is strong and expands widely across the front soundstage with music and sound effects. Surround use is present throughout, yet subtle. While I expected a little more envelopment, especially during the pod sequences, the rear speakers are still used effectively. Occasionally, the soundtrack offers creative split surround, such as the sound of bourbon being poured into a glass of ice. Even though the bass will not give one's subwoofer a significant workout, its presence is strong and clean when necessary. All of the soundtrack's shortcomings are miniscule; thus making this a sonically pleasing soundtrack throughout. Also available is the original 2.0 soundtrack, presented in both English and Spanish. Extras Review: I am disappointed by the lack of special features for such a classic film. However, I was interested to hear during the commentary track that most of the extra footage from the film was not saved, as they thought they did not have a need for it back in 1987. Other than shedding light on why there are a scant amount of extras, the group commentary with director Joe Dante, producer Michael Finnell, co-stars Kevin McCarthy and Robert Picardo, and visual effects supervisor Dennis Muren, is a thoroughly entertaining track. All of the participants are energetic, considerate, and provide a wealth of interesting information. Dante and Finnell tend to dominate the conversation, discussing the special effects and the cast, as well as many of the film's flaws without taking anything away from the magic. This is a tight commentary that never lost my attention. The theatrical trailer looks stunning in anamorphic widescreen. It is an effective promo that fully conveys the quirky humor of the film. 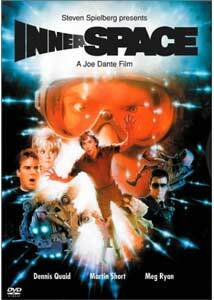 However, it is a bit strange, as it does not give a whole lot of insight as to what Innerspace is about. Finishing up this short group of extras are cast and crew filmographies, as well as an Awards icon, which merely consists of a one page still screen honoring the team who won an Oscar� for best visual effects in 1988. Innerspace is one of those rare needle-in-a-haystack 1980s comedies that has aged gracefully beyond its years. While a bit light on the special features, the excellence of this fine film has been admirably preserved on DVD. A movie with an endless re-watchability factor, I can easily recommend Innerspace as a purchase over a rental.